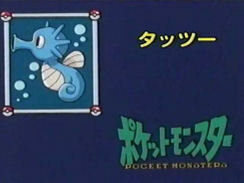 Japanese Episode 019: "Menokurage Dokukurage"
American Episode 118: "Tentacool & Tentacruel"
Satoshi and his friends have missed the ferry to the next town, so they have a few hours to kill. While waiting around the port, our heroes witness a ship exploding and help out with the rescue effort. After everyone has been taken to safety, the Obaba from Hatoba Port (the cousin of the Obaba in Aopulco) is revealed to be the owner of the boat. She explains how she's trying to build a hotel on top of the ocean, but the Menokurage in the area keep attacking the vessels she sends out. 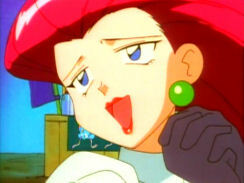 So, she decides to offer a reward to anyone who can help exterminate the pokemon. The Rocket-Dan appear and offer to help out, but the liquid they had brought along to stun the pokemon ends up making one of the Dokukurage grow to gigantic proportions! The giant Dokukurage and the hundreds of Menokurage begin attacking Hatoba Port while explaining, with the help of the Rocket-Dan's Nyasu, that they're upset because their home is being destroyed by the construction. 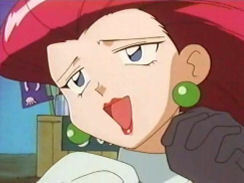 Kasumi, with the help of a Tattsu she had befriended earlier, are eventually able to reason with the pokemon and convince them of the sincerity of their apology. 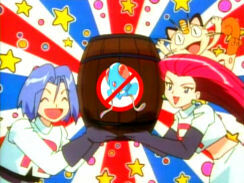 The jellyfish pokemon leave, warning the humans that if they ever endanger their homes again, they will show no mercy. Later, as our heroes ride on the ferry to the next town, Kasumi plays with her new pokemon, Tattsu, while remembering the importance of respecting the ocean and all who live in it. 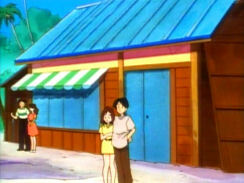 Since "Beauty and The Beach" was skipped over during 4Kids' initial run of the series, the dub tried to hide the fact that the episode even happened. 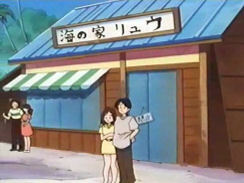 Which meant removing all the references to the previous episode and changing the place where the episode takes place (Aopulco and Hatoba Port are not exactly the same place). On an unrelated note, the Obaba at Hatoba Port and the Obaba in Aopulco have the same names, but they're both given different names in the dub (Aopulco Obaba's known as Brutella while the Hatoba Port Obaba goes by Nastina). This episode also has an annoyingly high amount of 4Kids background music. I didn't count how many pieces of Japanese music were kept, but it felt like it was on-par with an Advanced Battle-era episode. Ugh. Dokukurage keeps its Japanese voice when it’s not talking through Nyasu. First of all, the Obaba in this episode has the same speech quirk (tacking -baba to the end of her sentences) as the Obaba in the last episode. The dub ignores this altogether. Nastina: "I understand that you helped to save the men on my ship. Thank you very much! Ha ha ha ha ha!" Ash: "You're very welcome. I-I wonder if you could give us a ride to the mainland." Nastina: "You don't think you're gonna get away that fast, do ya!? Not 'til you see my new resort." In the Japanese version, Satoshi apologizes to Obaba for what happened back at Aopulco. Obaba then yells at Satoshi and his friends and tells them that she's the cousin of the Obaba who lives in Aopulco. During the above dialogue, the kanji on the fans of Obaba’s very effeminate and scantily-clad men is painted away every time they take them out. 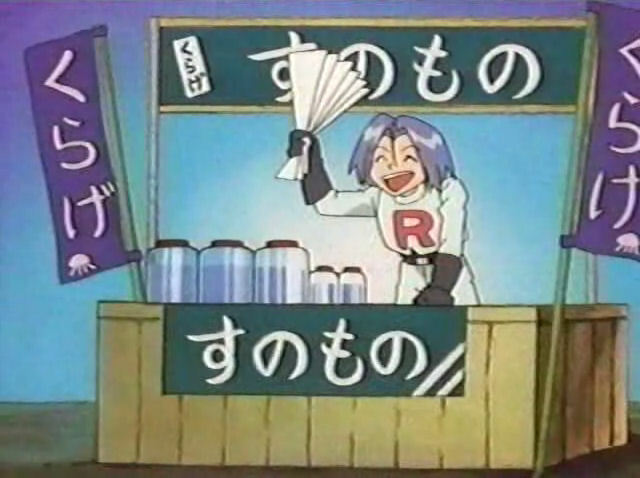 They break out the fans three times this episode, and each time 4Kids paints out the kanji. But the big question is: does anyone else wonder why Obaba has a bunch of almost-naked men hanging around her home? Could it be a joke alluding to the fact that Obaba's shares voice actors with Nuriko from Fushigi Yuugi (those of you who have seen the introduction of the character should know what I'm talking about)? Who knows? Click here to view images from the other fan shots. Finally, the reward for the extermination of the Menokurage is 1,000,000 yen (which is right at $10,000). The dub ups the prize to $1,000,000, most likely to avoid having to add any digital paint to the sign showing the amount of the reward above Obaba's desk. I find it kind of odd that the dub erases just about every trace of Japanese text in this episode but still keeps in the sign that says シーフード ("seafood") in every shot it can be seen in. The dialogue originally has Musashi and Kojirou asking if she’s the Obaba from Aopulco, and apparently she’s insulted by being mistaken for her relative. 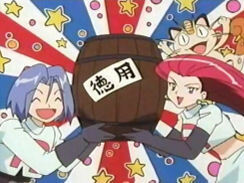 The dub rewrote it since, at the time that this episode premiered on American TV, Ash and his friends hadn't met Brutella yet. 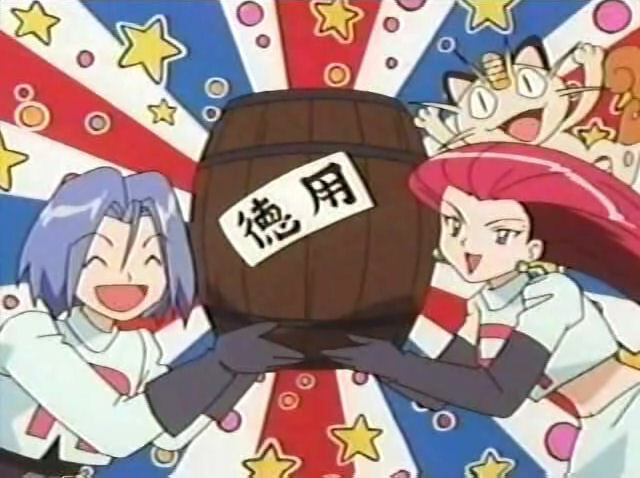 The barrel of the liquid the Rocket-Dan plan to use to get all the Menokurage has the kanji for tokuyou (“economical”) on the middle. 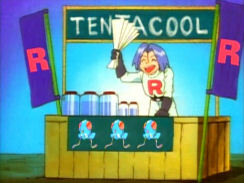 4Kids is getting their money's worth with that stock art of Tentacool, aren't they? I also love the MS Paint R's on the side banners there. Classy. What's funny about this edit is that when Musashi shows up, 4Kids gets a little overzealous with their digital paint and erases her right earring by accident. The pokemon for the “Who’s that Pokemon?” segment is the same, but 4Kids uses a different picture of the pokemon. Misty: "We've gotta try to protect Tentacruel!" Ash: "But there's gonna be a tidal wave!" Satoshi pretty much says the same thing - the only difference is that he calls Kasumi an idiot in the Japanese version while Ash doesn't. Later, When Tentacruel is talking through Meowth, his voice does that weird Giovanni echoey garbly voice thing. In the Japanese version, Nyasu’s voice just echoes like he’s talking in an empty gymnasium or something. 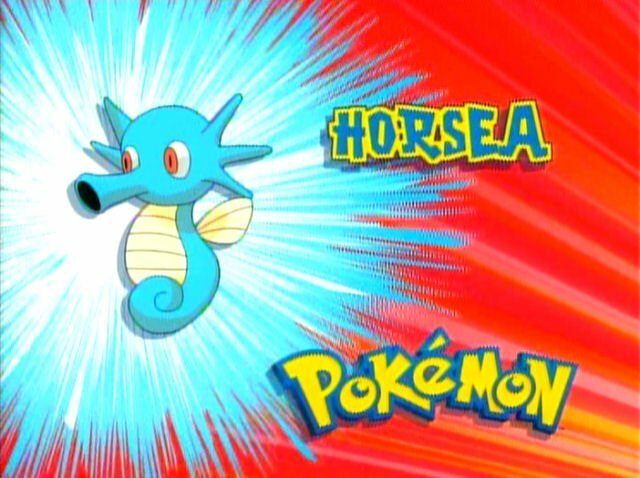 Misty accidentally called Horsea a “he.” 4Kids had been doing a good job of keeping the pokemon’s gender ambiguous, because pokemon aren’t supposed to have genders until Jouto (unless it’s an exception, like the Pink Butterfree two episodes from now). I think this is the first “gender slip-up” in the series, but to 4Kids’ credit it doesn’t happen too often. Right before Obaba lands on Obaba’s Beach House (the one she’s rebuilding because it got destroyed in the last episode), we see Ryuu’s restaurant. 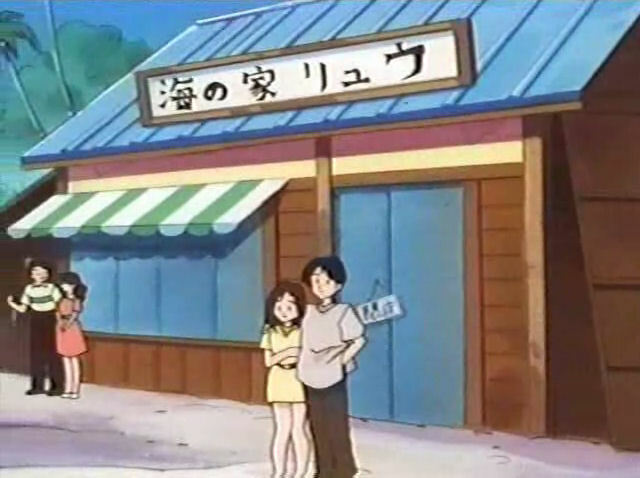 Well the sign with all the kanji on it (the same sign that, again, was left as-is in the previous episode) is painted off the roof by 4Kids, as is the “closed” sign on the door. 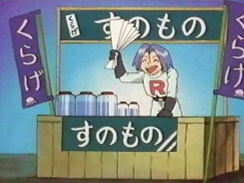 I suppose if 4Kids hadn’t been rushing the last episode, they’d taken the sign off throughout the entire episode.